As we keep our overheads to an absolute minimum we are able to provide Erudite books multimedia at very reasonable prices. Internet orders are further discounted (NZ$ prices are equivalent). Orders are posted from Australia, usually within 24 hours of an order arriving. I have just finished reading 'Saving Life ...' and wanted to tell you how brilliant it is! I've been telling lots of different groups/people about it. It is very easy to read and clearly outlines issues surrounding end of life care, explains the current system of medical decision making for the layperson and gives fantastic examples to aiod practical understanding. It clearly explains why Advance Care Planning is so important. Communication for the ICU Specialist - Teaching Pack. 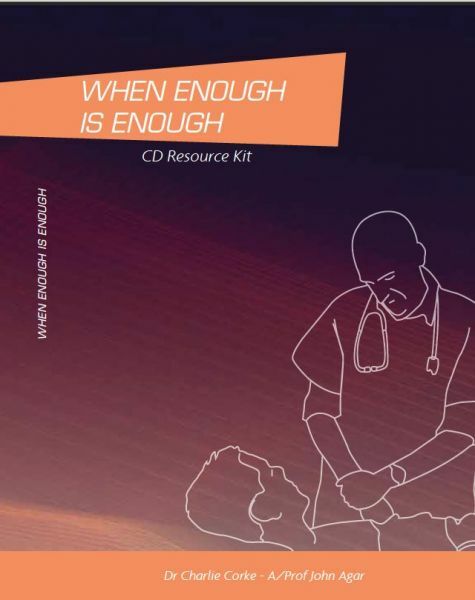 This booklet and accompanying CD is an outstanding resource for ICU trainees. The skills taught in this learning package are used frequently everyday by ICU specialists. I recommend it highly. The communication CD is a most excellent product and should be compulsory for all trainees (not just ICU trainees!). Communication for the ICU Specialist ... is an easy-to-read, useful resource book that should be mandatory reading for all advanced trainees in intensive care medicine. I strongly encourage every intensive care unit to obtain at least one copy of this remarkable book and CD combination, and to use it to train young doctors in the art and craft of effective and compassionate communication, and to provoke more senior staff to reflect on how to enhance their own skills and understanding. 'Communication for the Intensive Care Specialist' is an innovative resource for professionals training in intensive care and indeed other areas of medicine requiring effective communication skills. I have found it useful and would highly recommend both the book and CD to all trainees in ICU. I love practical obstetrics. Concise, practical, and worth the cost. Recommend to all junior doctors. The subtitle "Problem solving in the Emergency Department", an apt description of the teaching style. While not attempting to be a comprehensive syllabus for emergency medicine, it identifies many of the common scenarios and pitfalls that are encountered by clinicians, in a concise and effective format. While "Practical Emergency Medicine" is not a substitute for real-time supervision and support by senior staff in emergency medicine, it goes a long way towards helping junior doctors achieve their goal – to rapidly become a respected, safe and valuable member of the team. Books were well worth the cost, very good work, thank you very much. The format used in the 'Practical' books is by far the best for learning and retention of information that I have come across in an educational book. Each problem is highly relevant for their frequency, potential seriousness and the potential pitfalls associated with their management. They are presented as part of realistic situations that junior medical staff can relate to.